Azure SQL Data Warehouse recently announced the preview release of the Compute Optimized Gen1 tier performance tier providing customers with an enhanced offering of the service. With this major release, the service now has a 5X increase in compute scalability and unlimited storage for columnar data. Along with the increased capacity, customers are realizing an average increase of 5X in performance for query workloads. 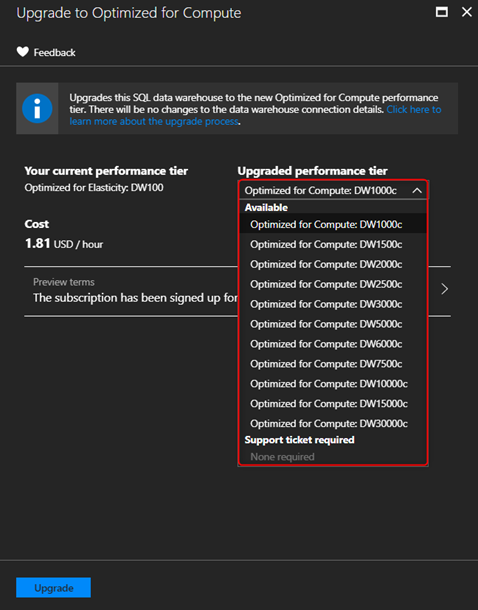 For existing Compute Optimized Gen2 tier customers wanting to capitalize on these benefits, there is now an option to seamlessly upgrade via the Azure Portal. The easy to use upgrade experience via the Azure Portal has no downtime associated with exporting and reimporting of the data. To learn more about the upgrade process, visit our upgrade documentation. If you need help for a POC, contact us directly. Stay up-to-date on the latest Azure SQL DW news and features by following us on Twitter @AzureSQLDW.